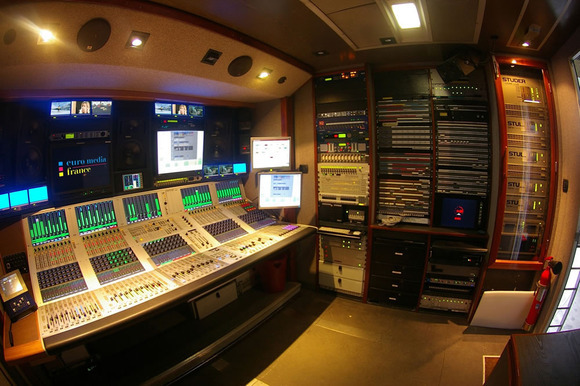 PARIS, France – France’s leading broadcast facility provider, Euro Media France (EMF), has become the most recent operator to install a new Studer Vista 9 digital console into one of its OB vehicles. Their XL2 mid-range HD truck is one of a fleet of 22 OB’s, which have been amalgamated under the EMF umbrella since the merger of subsidiaries EMT, SFP and VCF at the beginning of this year, and one of six HD-equipped vehicles. The 13.6-metre truck supports up to 24 cameras and incorporates a VTR area, monitor stack, production area—and now a top specification audio mixing front end. The new console was supplied by Audiopole to replace an old Studer D950—which was the first digital desk that SFP ever bought during their days as an independent. It is one of several Vista 9 consoles already supplied by Studer’s French distributor since its launch in June of this year. The new 52-fader Vista 9 sets new standards in flexibility and usability. Configured88 I/O AES-EBU, with 48 input Mic/Line and 32 analogue outputs, it offers two fibre optical stage boxes, including 24 input Mic/Line, eight AES-EBU I/O, two MADI I/Os and one Ethersound I/O—and has 5.1 and Dolby surround capabilities. The sale was facilitated by Audiopole director, Jean-Philippe Blanchard, who over the years has been responsible for equipping SFP and VCF with the entire suite of Vista consoles, including the first Vista 5 (and one of the first Vista 7s)—as well as the D950—during their days as independents. The XL2 OB specialises in major sporting events, such as Tour de France and Premiership Rugby for Canal+, as well as talk shows and light entertainment, such as Le Plus Grand Cabaret du Monde for France Television. Following discussions with Blanchard, EMF’s Technical Operations Director Franck Fradet first saw the Vista 9 at the Soundcraft Studer headquarters in Potters Bar, UK back in May this year. This was all the convincing he needed and delivery took place in August—just days before its debut at Premiership rugby match in Perpignan. Franck Fradet was impressed with the immediate stability of the software and the fact it could be pressed into action ‘straight out of the box’. The HISTORY feature, in particular, has been highlighted by Vista 9 users as it records events such as overloads in the audio path of each channel, and highlights them in red on the channel waveform. The operator can then review which channel had such an event, up to 30 seconds after the event has occurred. All this contributes to a market-leading broadcast mixing environment. “I think the Vista 9 now offers the best surface anywhere because of its quick access and configuration,” he concludes. “There is never much time for training and one of the advantages of the Vista 9 was that our engineers were already trained on other Vista desks, so they were able to work with the console quickly. Based in eastern Paris, Euro Media France is part of the large pan-European broadcaster, Euro Media Group, formed in 2007. France remains the most important territory, and is today responsible for 50% of group turnover, with resources and logistics now shared.